Here is the list of Best Free Anti Keylogger Software which will help you to safeguard your data and important credentials from being recorded and leaked by hidden keylogger programs in your PC. If you think that you are being spied upon and do not want your sensitive/personal data to be compromised, then this article is for you. These Anti-Keylogger programs can easily defeat keylogger/spyware program by not letting them record your keystrokes as well as screenshots. Some of them encrypt your keystrokes in such a way that a keylogger records the encrypted keys and not the original ones, thus fooling a Keylogger software. You can also maintain a whitelist of programs to enable/disable the keylogger protection mode. Some Anti keylogger mentioned in this list are so advanced that they work as keylogger detector software to detect a hidden spyware or similar type of programs, and prompt you to disable or terminate them completely. As we are dependent on computers for most of our daily work, we exchange a lot of data everyday. These data may range from a simple statement to confidential information, like: Bank Details, Social ID and Password, etc. Your confidential data can be snooped and leaked with keylogger software easily. To protect your data, you can use free Anti-Keylogger software mentioned in this list. Checkout the list to know more about these software and also know how to disable keyloggers using these. Of course, no such software is fool proof, and there might be some keyloggers that might be able to find their way around these software, but in our testing, these anti-keyloggers were able to find all the keyloggers that I tested them against. In this list, my personal favorite Anti-keyloggger is not just a single one rather two of them. The first one I prefer is Ghostpress, as this free Anti Keylogger software protects you from any type of advanced keylogger or spyware program. With this program running, keyloggers simply cannot record or store keystrokes. Also, this freeware lets you enable and disable the protection mode in a single click and features a widget for the same. You can even maintain a Whitelist of programs here. 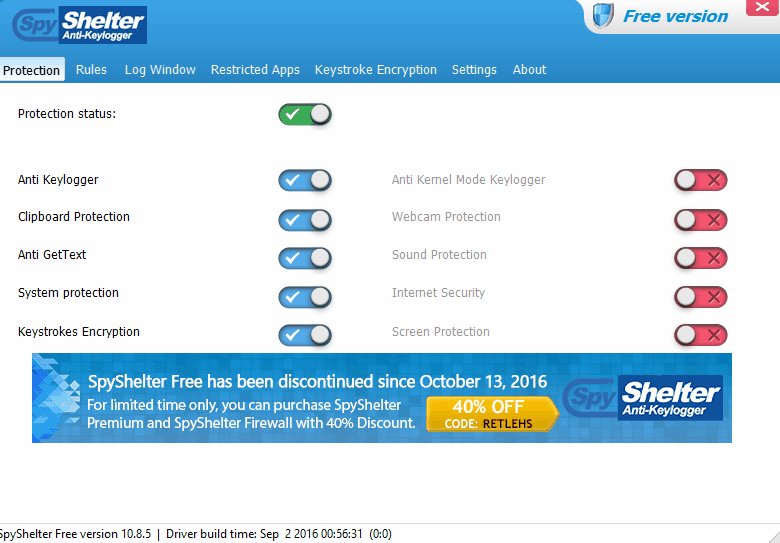 Another of my favorite programs is SpyShelter Anti-Keylogger Free Version. It is a bit more advanced than Ghostpress. I like this freeware as it is a keylogger detector program and detects keyloggers and other malicious programs which try to store your keystrokes and screenshots. You can set and maintain a list of detected programs which can be disabled or allowed to keep working. You can also check out the list of best free Keylogger Software, Anti-Virus Software, and Memory Optimizer Software. Ghostpress is a free anti-keylogger software which disables any keylogger program from functioning in your PC. Computers can be infested with many malicious and spy recording programs, which silently stores your credentials as keystrokes and leak them. This freeware can easily safeguard your PC from such software. It is a simple yet very effective anti keylogger software, which can hide keystrokes that you enter in your PC in real-time. For testing purpose, I installed an advanced keylogger program on my PC; Ghostpress very effectively fooled the keylogger and hid my keystrokes. You can easily install this anti-keylogger software in your system and enable its protection mode to safeguard your PC. You can even enable it to load on system startup. Its protection mode can be enabled/disabled in a single click. For this, a widget is provided, which lets you enable and disable the protection as well as open the main interface of this freeware. It also displays the program for which this free anti-keylogger program is protecting in real-time. You can maintain a Whitelist of programs for which you don’t want the protection On. For this, the only thing you have to do is manually add the .exe file of those programs in the list. Besides all these, this free anti-keylogger software also features Delay Protection options under Security menu, which are: Disabled, Standard, and Enhanced. These are basically used to safeguard against detection using your typing style. By default, this is set as disabled, and I would keep it that way. Zemana AntiLogger Free is another free Anti-Keylogger, which prevents a keylogger program to record your keystrokes on a PC. It encrypts all your keystrokes and decrypts them on to the specific program which you are currently working on. Thus, it provides an overall protection from hidden keylogger programs, if present on a PC. 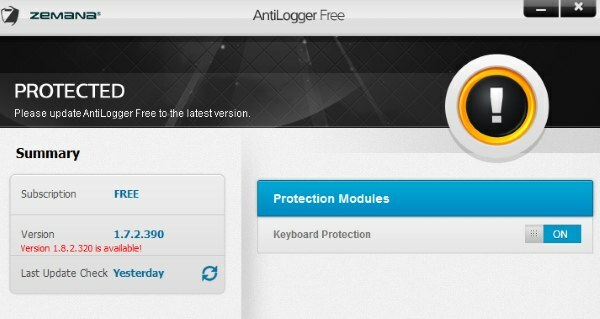 I installed a keylogger program on my PC to test the functionality of Zemana AntiLogger Free. It worked successfully on all the programs on which I was typing, ranging from a simple notepad program to a web browser. All the keystrokes I entered were protected from being recorded by the keylogger program. This freeware has a simple interface which is quite convenient for you to understand. Here, only a single button is displayed, which you can enable with a click to get this free anti-keylogger program working. As soon as you turn the protection mode ON, it displays a check mark to show the status: keyboard protection mode is enabled. You can select this freeware to show notification in system tray and access the main window from its tray icon. Apart from all these, you can assign a hotkey of your choice to enable or disable the protection mode, rather than accessing the same option from the main interface of this free anti keylogger software. Although it doesn’t have any feature other than to protect keystrokes on your PC, it surely is worth to use this freeware to defeat a keylogger program. SpyShelter Anti-Keylogger Free Version is a free anti-keylogger product of Spyshelter software. Its main function is to provide protection to your PC from keylogger or similar spyware programs by working as a keylogger detector program. It is quite a unique anti-keylogger software, as it protects you from hidden keylogger programs in two different ways. First, when you turn ON the protection, it starts to monitor your PC and automatically detects any hidden keylogger or spyware programs trying to record your keystrokes. It then prompts you to take actions on the detected programs, which are: Allow, Deny, and Terminate. For this feature, you can easily set Rules for detected programs to be permitted to continue their process or not, or terminate them if they are a threat. This peculiar feature of SpyShelter Anti-Keylogger Free Version, gives an overall protection of your personal details you have entered or have previously stored in your PC, thus safeguarding you from any intrusion. The second protective feature I encountered accidentally with this free anti-keylogger software is that even if you turn its protection OFF, it continues to encrypt keystrokes you enter in any browser. It means that even if you don’t want this freeware to detect a keylogger, it protects the data you enter online. I believe this feature is just an awesome thing for an anti-keylogger program. On the interface of this freeware, you will find a number of protection options, which are: Anti keylogger, Clipboard Protection, Anti GetText, System Protection, and Keystrokes Encryption. I will suggest that you keep these options always ON to get an overall protection; however, you still have the liberty to turn some of the features OFF if your want. You can even select it to load at system startup and access it from system tray whenever you want. With all these awesome features to protect PC from keylogger or spyware software, you can definitely use this free keylogger detector to get your PC protected. 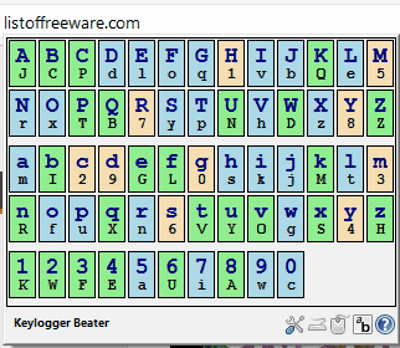 Keyscrambler Personal is a free and popular keypress scrambling software, which encrypts all the keystrokes you enter in any web browser. Its only function is to encrypt the keystrokes you type in browsers and then decrypt them back in the area where you are typing, thus dodging keylogger programs from recording original keystrokes. You can enable it to run with system startup and assign a hot key to enable/disable it. Even for an advanced keylogger programs, like the one I installed in my PC for testing purpose, KeyScrambler Personal defeated it successfully. The keylogger in my PC was only able to record the encrypted keystrokes and not the original ones which I entered in my browser. You can definitely use this freeware without being worried about your data being stolen from web browsers. Keylogger Beater is not exactly an anti-keylogger program but it lets you bypass a keylogger program from storing your personal data, like: Username and Password on Mozilla Firefox browser. Basically, it gives you a virtual keyboard which will help you enter your credentials in Firefox browser without being recorded by a keylogger program. This virtual keyboard program has two modes that you can use to enter data when working in Mozilla Firefox. But first of all, you have to activate it by pressing its Hot-Key: Ctrl+Alt+k. This will display a virtual keyboard below the field where you want to type in Firefox. Now with this keyboard, you can either choose keyboard or mouse input method. Mouse input method is just too simple to use and you just have to hover your mouse pointer over the desired key in the virtual keyboard. It will then automatically press and input the letter/character in the desired field. The keyboard input method is a bit complicated. In this mode, there are Shadow Keys with their Real Keys (right above). You will have to find and press its representative shadow key from the keyboard. Although this is a hectic thing to do, the keylogger will record the pressed shadow key and not the real key. You can even use the keyboard input method from your mouse rather than pressing the Shadow Keys from the keyboard. For this, you will have to enable Both option. Let me bring this to you knowledge that this free Add-on will only work for entering Usernames, Passwords and URL/Text (address bar). Apart from these fields, this Add-On cannot be used elsewhere. If you want to use some other browser other than Firefox and still want to use this type of tool, then I suggest you to install some virtual keyboard programs in your system, which provide similar service.